Garson, G. D. (2016). Validity & Reliability, 2016 Edition. Asheboro, NC: Statistical Associates Publishers. @c 2016 by G. David Garson and Statistical Associates Publishers. worldwide rights reserved in all languages and on all media. Permission is not granted to copy, distribute, or post e-books or passwords. 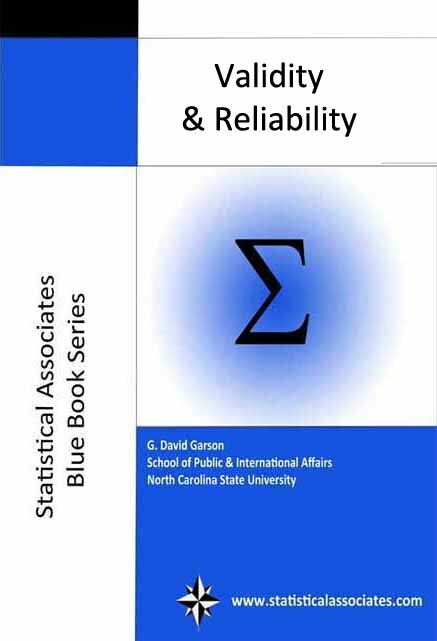 An introductory graduate-level illustrated tutorial on validity and reliability with numerous worked examples and output using SPSS, SAS, Stata, and ReCal software. At 202 pages, almost twice the coverage as the 2013 edition. Totally revised throughout with dozens of additional new figures. Covers SPSS, SAS, Stata, and ReCal software. Links to all data files used in worked examples. Extended coverage of Cohen's kappa, ICC, and other traditional reliability measures. Extensive coverage of factor-based reliability measures such as average variance extracted (AVE), composite reliability (Raykov's rho), the Fornell-Larcker criterion, and others.